Swimmers at Manchester Metropolitan are celebrating after achieving the University’s best ever results in a swim competition. MMU Sport swimmers attended the BUCS Short Course Swimming Championships at Ponds Forge International Swimming Centre, where they secured 12 medals and accumulated 104 BUCS points – by far the University’s best achievement in a swim competition. Sports Scholars Katie Matts, Lewis White, Chloe Golding, Emma Day and Sport and Exercise Science student Ella Cooper-Holmes competed at the three-day event alongside over 1,700 students from 87 different institutions. With six bronze, two silver and four gold medals, Manchester Metropolitan placed fourth overall. Swimming is one of the biggest individual sports within BUCS. The Short Course competition is the first of three swimming competitions in the season and is open to a range of abilities, from Olympic and Commonwealth athletes to participation club swimmers. However, it wasn’t just medals to cheer about. 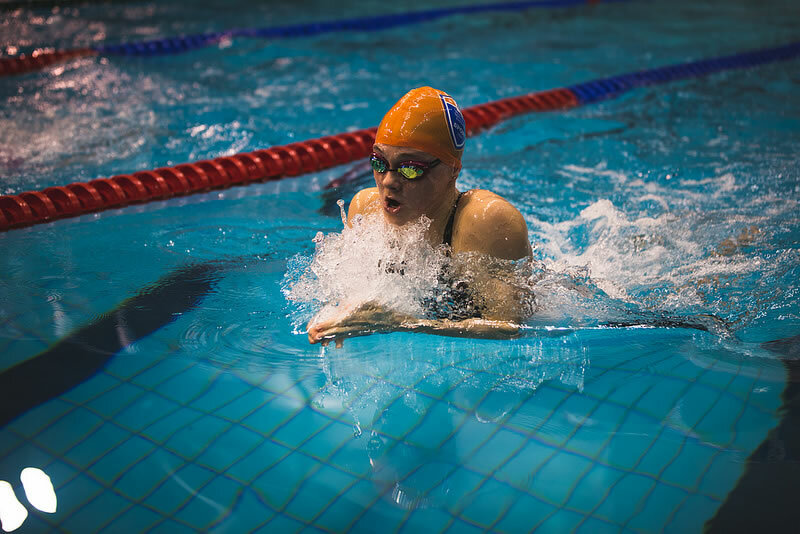 Prior to the competition, first-year student Ella Cooper-Holmes was a para-swimmer that MMU Sport had been supporting with various services such as lifestyle management. Ella was part of Cockermouth Swimming Club prior to coming to Manchester Metropolitan but she was not part of the University’s scholarship scheme. Due to her success at the competition, winning two bronze and one gold medal, she has now been awarded a place on the full scholarship programme. The Sport Scholarship at Manchester Metropolitan offers athletes a bespoke package, which includes nutrition, physiotherapy, strength and conditioning as well as financial support and contributions towards their fees. The scheme attracts hundreds of applications from athletes around the world – all looking to develop both their academic and athletic potential with Manchester Metropolitan University.